When planning a menu for your party, take into consideration who will be at the party, if there are any special dietary restrictions and whether you want to offer your guests a casual or formal setting. Make sure you offer a variety of items so that even the pickiest guests will be guaranteed a delicious treat. Presentation is everything! Have food items placed on silver serving trays and presented in an attractive manner. A casual cocktail party can be held at any time. Whether it is something thrown together on a Friday night or planned in advance, this type of party is about enjoying the company of your guests and relaxing. A great way to impress your guests is with a formal sit-down dinner. A sit-down dinner should include a variety of courses such as an appetizer, soup or salad, main course and dessert. Each course should be brought out individually to each guest. Wine can be served with each course and paired accordingly. Appetizers can be served when guests arrive and can consist of assorted artisan cheeses, cubes of bread, crackers and fresh fruit. Allow guests to choose among a variety of drink choices. Offer both alcoholic and non-alcoholic options. Totally 80s: In addition to cool music and clothes, create a menu that reflects the time period. Personal pizzas, wine coolers and fruit roll-ups were all made popular in the 80s. Iron Chef: Pick an ingredient and make it the star of your menu. For example, if you choose avocado, feature an avocado soup, serve guacamole, chicken in an avocado sauce as an entrée and for dessert serve avocado mousse. Destination: This theme can be almost anything imaginable. Do you have a favorite vacation spot? Did you go somewhere spectacular on your honeymoon? Focus on a destination and feature food items that are from that region. For example, a Hawaiian theme could be a luau complete with pig roast and plenty of pineapples and fresh fruit. Another factor to consider when you think of menu ideas is the location. A party located outside requires a little more food planning and prep than a party inside. Include dishes that avoid mayonnaise or cream as a major ingredient. Look for food ideas that can safely kept in a warmer temperature or keep the food on ice so it doesn't spoil. The idea here is try to keep from running into the kitchen to replenish the food. Main Dish: Grilling up a slab of ribs or a pile of burgers can be a fun and tasty idea. For a slightly more upscale grilling party you may want to look into using a homemade spice rub for some quails or filet mignon. Sides: Pick out a few traditional sides, like coleslaw and potato salad. Gelatin salads are great, as is a big bowl of fruit. Dessert: Look for finger food desserts, such as cookies, bars and cupcakes. These are easy to grab between games and other activities. Although a barbecue is normally considered an outdoor event, dinner party guests that linger will eventually end up indoors. You may want to prepare some small snacks before hand for them when they do migrate inside. A party menu's success depends on the amount of thought you put into it. 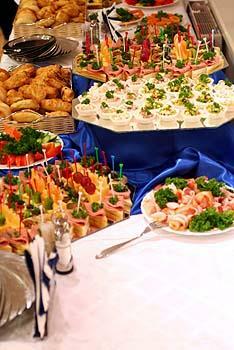 Have fun, use your creativity and taste buds to come up with a delicious spread your guests will not forget. Remember to add special touches such as a beautiful centerpiece, festive decorations or party favors as a compliment to your party and menu.